Following the instability of the Middle Ages the Renaissance (literally ‘rebirth’) marked a transition to a period of intense learning and cultural development, inspired by a love of classical art and architecture from ancient Rome and Greece. It was a time that saw marked developments in art, literature, politics, learning, architecture and interior design. Thought to have begun in 14th century Florence, the Renaissance saw a marked shift in poetic and artistic ideals. Palaces of the wealthy were lavishly decorated to show status, with frescoes, tapestries, sculptures, intricate furniture and exquisite fire surrounds in order to entertain guests in style. Renaissance ideals were reserved mainly to those of wealth and power, and it is the artefacts of their lavish spending which remain to us today. Renaissance architecture and design was grand in scale and focussed on the harmony of form. With an increase in trade, many design choices were made with foreign elements as inspiration. Trade was strong with the Muslim countries of the East, and many artists and designers of the Renaissance used this as inspiration in order to inform their own work. Some of these design choices can be seen most notably in the use of leaf motifs, often used in Middle Eastern art. Toward the end of the Renaissance there had been a move toward the ‘Mannerist’ style. By this point artists and designers had moved past the realistic idealism of the High Renaissance and focussed on a more artistically free style of design. Furniture and interior design styles were often decorated with ‘grotesques’, slightly odd looking gargoyles, or oddly shaped characters. There was a move toward exaggerated human forms used to convey human emotion through feeling rather than a realistic depiction. Many inspirations were taken from the natural world rather than purely from antiquity, and designs of this period were often lavish and conveyed a sense of humour. Mannerist designers would often mix a number of motifs, using the human form, ‘grotesque’ creatures, and nature motifs all at once. 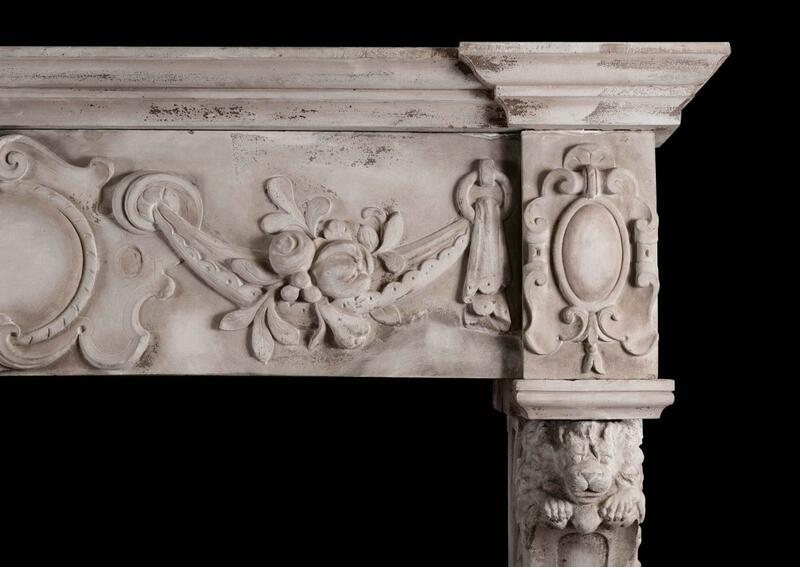 A mix of these themes can be seen in this stunning example of Renaissance mantel design on offer from Thornhill Galleries. 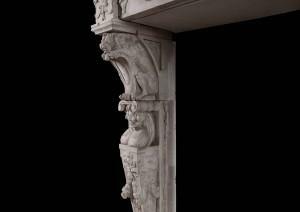 http://www.thornhillgalleries.co.uk/item/stock-number-3756/ This large stone fireplace uses the caryatids inspired by the classical arts, while combining animal, human, natural and ‘grotesque’ motifs in to one exquisitely rendered fire surround. Fireplaces were key features of the Renaissance home. They sat in the Sala, the biggest room in the house. It was a space used for various entertainments and hosting guests, so the decorations of the space were meant to show the status and wealth of the family. The chimneypiece of an Italian Sala was a key feature, as it provided a space for social gathering. Art of the time often shows people gathered around the fireplace on low slung chairs, enjoying entertainments or participating in pious activity. 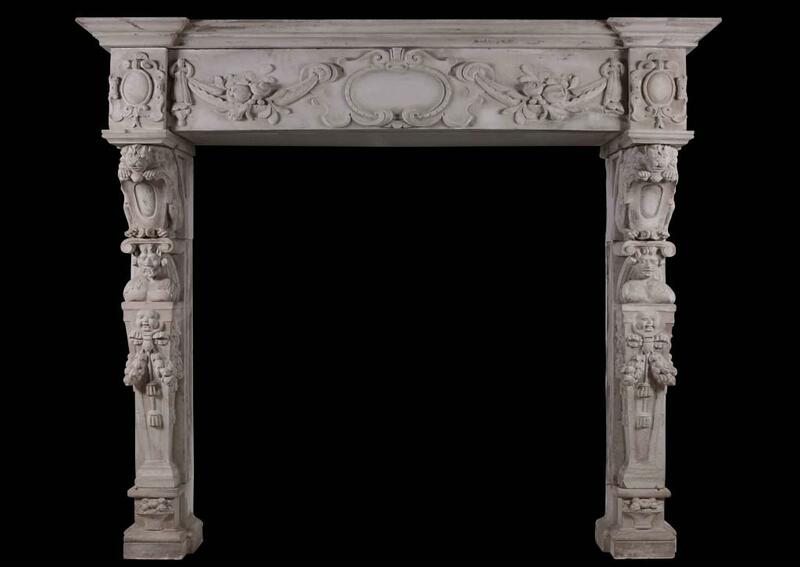 Carved Italian marble fireplaces with classical and mannerist forms turned an everyday functional object in to a work of art. Art which is still appreciated in all its forms today.